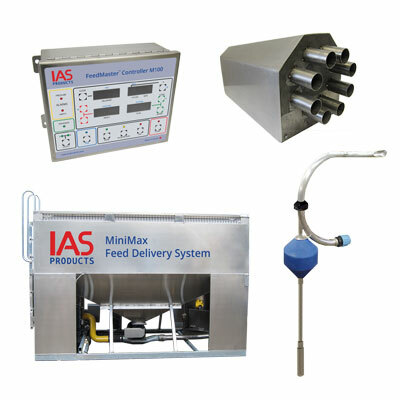 MiniMax™ is a flexible, cost effective alternative to large, costly centralized bulk feed delivery systems. Build a site-specific feed delivery and feed broadcast system by using interconnected modular components that are easily connected and reconfigured as site requirements change. Enlarge the size of your feeding system as you grow by adding additional modules or rearranging existing modules to address changes in farm layout. When matched with our simple to use PLC controller, farm feed management has never been easier to manage. At the heart of MiniMax™ is a compact, self-contained feed storage and dispensing units controlled manually or with an operator friendly FeedMaster™ Controller. Using industry standard HDPE pipe; inline couplers and IAS designed feed delivery components; site-specific feed distribution networks; and/or feed broadcasting systems that can quickly be assembled. Delivery components and feed delivery modules are simply added, removed, or interchanged as needed to reconfigure each system to address changing site conditions and farm growth. By following the five easy steps identified below, our clients can build a feed delivery system that addresses their immediate site needs with the knowledge that as their operations expand so can their feed delivery system. STEP 1 MiniMax™ feed storage and dispensing hoppers are available in two primary configurations. A 500- kilogram capacity enclosed storage and dispensing hopper addresses site applications where the use of small 22-kilogram bagged feed and small feed dispensing over time is the norm. For applications requiring higher feed loading and more frequent feed dispensing, an open topped style storage and dispensing hopper will easily handle 1,000- kilogram bulk feed bags. To further promote MiniMax™ site versatility and adaptability IAS offers the option of mixing and matching features from one hopper style to the other and/or increasing the hopper capacity to address specific site operating needs. Both closed and open top hopper styles incorporate a rotary valve feed dispenser, positive displacement blower, power drive assembly, and PLC feed controller within the profile of the hopper making the choice of either hopper unit quick to position and easy to set up and operate. STEP 2 Select from industry standard high-density polyethylene pipe and compression couplers to connect together of your feed network much like a Meccano® set. Connect a broad range of feed dispensing mechanisms using simple to connect pipe runs as needed to address practically any farm site feeding requirements. Step 3 Working outwards from the chosen MiniMax™ feed storage and dispensing hopper, opt for a 2- Way Diverter Valve, a two-position valve assembly manufactured with a smooth inner liner stainless steel flexible hose assembly, to provide repetitive switching of air/feed flow direction between position 1 and position 2 with 100% assurance of no feed pellet breakage. (Shown here on the left with a 3-inch to 2-inch reducer on each of the two outlets to handle optional smaller HDPE pipe sizing). Or choose an 8-Station Distributor Head, an eight-outlet air/feed distributor designed to send air and feed pellets to any one of eight specific locations. Manufactured with a smooth inner liner stainless steel flexible hose assembly that directs air/feed flow to the programmed outlet with no feed pellet breakage. Step 4 The outlet side of the 2-Way Diverter Valve or 8-Station Distributor Head may be connected to one of two feed pellet-broadcasting systems. Feed pellets are moved around the farm for immediate feed pellet broadcasting over pens, ponds or raceways using Aerite™ Feed Spinner Heads. Alternatively air blown feed pellets move along to the end of the pipe network where the air/feed mixture passes through a cyclonic decelerator designed to direct the pressure air out the top while allowing the feed pellets to drop out the bottom into an AeroSpreader™ feed broadcaster for short term storage and timed feed dispensing. Step 5 The FeedMaster™ Controller M100 and M200 are easy to operate PLC modules that allow access and control of a range of feed delivery parameters including feed dispensing rates from the MiniMax™ hopper positioned rotary valve, inline valve switching on 2-Way Diverter Valve modules, as well as inline feed distribution as managed through the 8-Station Distributor Head modules. 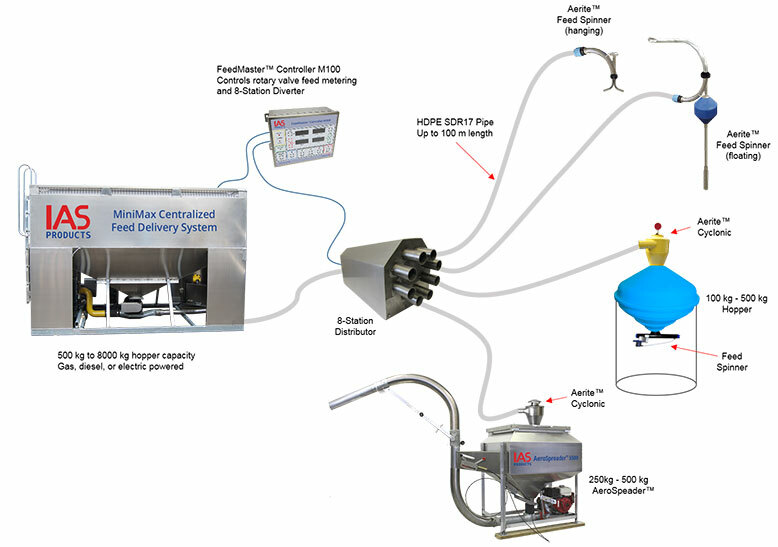 Just like the MiniMax™ scenario identified here, this versatile controller is also equally at home on the side of an AeroSpreader™ dry pellet feed broadcaster where its duties include controlling its own group of 2-Way Diverter Valves and/or 8-station Distributor Heads for timed dispensing of feed pellets into one or more cages using Aerite™ Feed Spinners. When MiniMax™ is configured to provide immediate Aerite™ Feed Spinner Head broadcasting a model M200 FeedMaster™ Controller is positioned at the main feed loading and dispensing hopper. A model M100 controller is placed with each AeroSpreader™ feed broadcaster when MiniMax™ is set up as a feed distribution system to move feed to pen side feeders for timed feed broadcasting. The IAS Products Ltd design team is here to supply full FeedMaster™ Controller software support with the knowledge and tools available to further adapt these standard programs to address alternative site applications.